This hand-squeezed lemonade is fresh and delicious with no artificial colors, preservatives, or artificial flavors. Clean and dry one whole lemon. Cut lemon in half lengthwise and store one half for another use. Cut the remaining half of lemon lengthwise into two wedges. 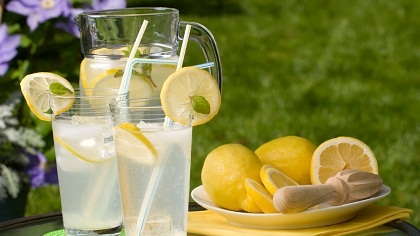 Squeeze juice from each lemon wedge into a large single serving beverage container. Sweeten with pure Stevia powder extract (2 mini scoops works best) or sweeten to taste. Fresh fruit may be added for extra flavor (such as cut strawberries and/or pineapple chunks).